MAN HUNT: Police are attempting to locate Dwayne Silcox in relation to a shooting incident in Bundaberg West last night. THE identity of a man being sought by police after a shooting incident in Bundaberg West overnight has been confirmed. 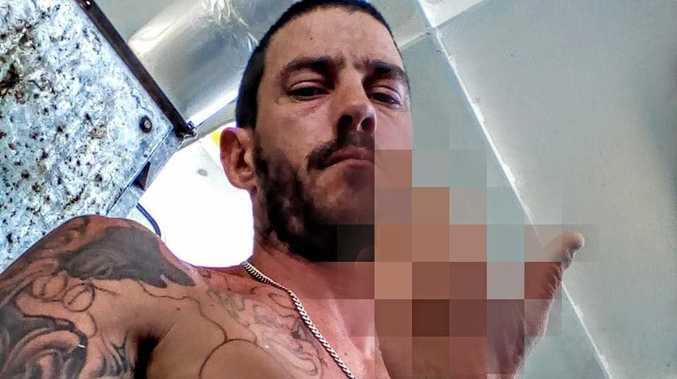 Bundaberg police believe Dwayne Silcox pointed a gun at a woman and pulled the trigger, thinking the weapon had not been loaded at the time, accidentally shooting the woman in the leg before leaving the scene. Emergency services received reports of the incident at 8.48pm yesterday, but a Queensland Police spokesman said the man had left before officers arrived. The spokesman confirmed police had located the weapon and a hunt for the man continued this morning. The woman in her 40s sustained a gunshot wound to the thigh and was taken to Bundaberg Hospital where police briefly spoke to her regarding the incident, and the spokesman said officers will speak to her again today. Anyone who sees the man is urged not to approach him and to contact Policelink on 131 444 immediately.